Leveraging deduplication in backup environments yields significant advantages. The cost savings in reducing disk capacity requirements change the economics of disk-based backup. For some organizations, it allows disk-based backup - and recovery - to be extended to additional workloads in the environment. For others, deduplication makes it possible to introduce disk-based backup where it may not have been feasible before. 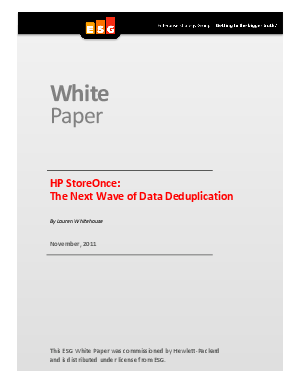 HP StoreOnce deduplication simplifies the deployment of deduplication technology across the IT infrastructure.